The story goes like this . . . One day over thirty-five years ago, geologists were drilling for gas when they hit a large underground cavern. In fact, it was so large that it swallowed the scientists' drilling equipment and camp. 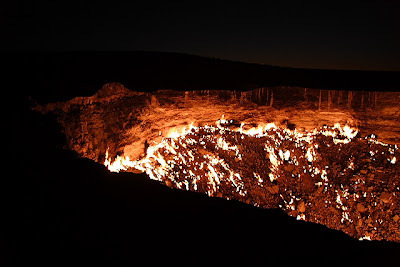 Worried that poisonous gases might be released from the hole, the geologists decided to ignite the gas in the cavern and let it burn off. That was thirty-five years ago, and the cavern is still burning. OH MY GOSH THAT IS AMAZING! That is so interesting! 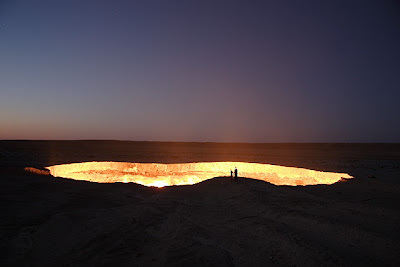 Isn't that a bit like the hole that Ananka discovers in the beginning of "Kiki Strike: Inside The Shadow City"? I love that part of the book how she goes inside the hole with a rope and finds 'Glimpses of Gotham"
Hazel: To go to Germany? I believe it's $5. That is so cool! Where do you FIND this stuff? It is so weird and awesome! Traveling Gnome-She's just incredibly, amazingly gifted that way. That is the coolest thing ever! 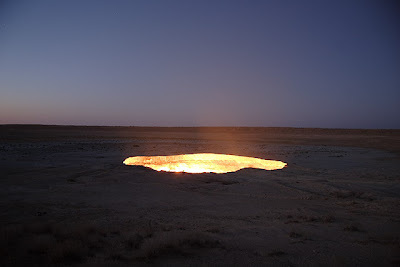 Maybe one day when the gasses are gone and it stoped burning then people can explore it! And I learned of a cave where you skydive into it! the door of hades is so... freaky. don't you think that burning the gas is a little stupid... I mean it's still burning, so if it was poisonous, don't you think some of it has escaped? I think in the next book deedee should talk about the door to hades, it seems to e in her line of work! I want to go there!!!!! Thank God that this is in Eastern Europe. Otherwise my mother would be PARANOID about stuff like this. It's probably good that she's never seen this website. that's incredible! wouldn't the cavern explode? i wonder if the new movie (journey to the center of the earth) was inspired by stuff like this? also, in a song, (i think it was "Viva la Vida", but i can't really remember) it said "the center of the earth is the end of the world." idk, it's still cool. Is the "door" still growing? Whoa. This world is inredibe and it's totally Wicked!. So, what type of gas is it that's burning? And have they tried to extinguish it? I mean, for 35 years, that's a lot of CO2 being produced, witht Global Warmng and all. Traveling Gnome: I LOVE your profile pic. Hilarious! Michele: I did! I couldn't get the one pic big enough to see the UFO, but the caterpillar was sure nasty. Seems like a waste of natural resources to me. or at least it tried! and that's why we all eat pie! so i got a haircut! so i drew a picture! whooo I wonder if you could take like a parishot like thing and tonnel the excaping gases to like a wendmill thing that made energy from it power things and then you can take the gasses and bottle them and use them on grils or torches . . . who knows it could be a hole company thing. foo foo really "what was that"?????? In Shamokin, there's a coal mine fire that's been burning ever since my Grandma was a kid. So my dad goes over and leans down to peer in the smoke-emitting cracks in the ground, even though there's signs warning you to stay away in case of a cave-in. We're like, COME BACK! YOU'RE GONNA DIE!! And he's like, I'll be fine, stop freaking out. He was OK, though. And COOL! Low shipping charges! I take it back, the song was 'Jesus of Suburbia' by Green day.